Remove stem of raisins then wash and soak them over night. If you are using whole fenugreek seeds then soak them as well. Next day drain out excess water from both and coarsely grind them in a mixer grinder. Transfer the ground paste in a pan add sugar and cook on low flame till all the water evaporates and you reach desired consistency. Add rest of the ingredients and cook further for 2-3 minutes. Switch off the gas and let it cool then store the chuttney in an air tight container. Enjoy it with roti sabzi or with parantha or poori. You can use fenugreek powder in place of fenugreek seeds in that case you need to soak rasins only and add fenugreek seeds powder along with all the spices. 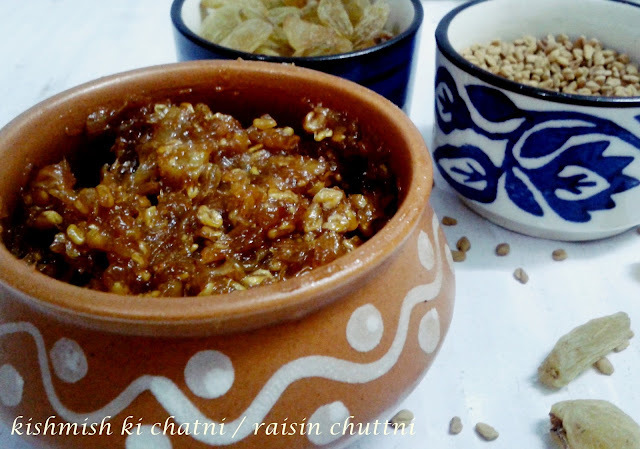 If you taste the chuttney immediately it may give a bitter taste due to fenugreek powder but after some time it will settle.